As previously reported by BHB, the two-story commercial building and its air rights at 172-174 Montague Street were sold in June, with plans to turn it into a highrise condo development. As we also noted, Irish pub & restaurant Emmonn’s In Brooklyn at 174 shuttered June 17. 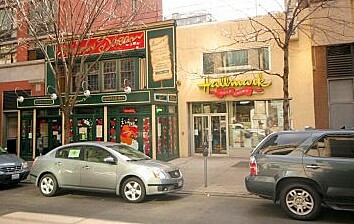 As expected, the Hallmark store next door at 172 Montague has now officially closed its doors, as well. The shop opened in 1991. Here’s some gruesome trivia: In 2003, 37-year-old co-owner Barry Curwin killed himself with a handgun inside the Hallmark store. The 8,150-square-foot property at 172-174 Montague sold for $12 million, according to the New York Observer. The building has a C5-2/DB zoning designation, giving it air rights of up to 60,000 square feet. Residential rental building The Archstone next door at 180 Montague Street, built for $101 million in 2000, is 33 stories. Its 186 units range from $2,497-$3,037/month for 1 bedrooms, and $3,903-$4,128/month for 2 bedrooms. Seems like someone at the Archstone will be loosing some sunlight and a view. Dear C. — Let’s start at the very beginning: A, B, C, since you apparently can’t read. What are you talking about? There are links covering the story in the past. The news here is that now Hallmark closed, too. Man, even on a beautiful Saturday, some folks just love to moan and whine. Ease up, meanie. I recall PeterHillary he met a similar fate at this location. Montague Street has yet to recover from the move of Brooklyn Union Gas on Montague Street all those paychecks gone. Montague Street needs an economic boost but i am not certian how well a new hotel will do? Hallmark closed quite a few weeks ago. The Heights really doesn’t need another high rise condominium! How sad Eammons closed, what next, LaTraviota, Grand Canyon, Liche Nut, Happy Day’s Diner and Heights Cafe? Is the nature of this upscale, bohemian neighborhood changing. Are they making restaurants convenient, inexpensive and still able to relax and enjoy a full served lunch or dinner in a timely manner? Know Fulton St has an abundance of fast food restaurants, and near the courts is the Marriot and Morton Steak House, are they taking away from the neighborhood restaurants? Hallmark closed at the end of June. worked at hallmark briefly. rumor was that the guy’s ghost haunted the basement. it WAS creepy. didn’t want to be down there alone after closing…. No, we don’t need another high-rise condo, but it looks like we’re getting one. I just wonder if management at next-door 180 Montague will reduce the rents for tenants who lose their great views. Probably not. Wonder if the ghost will stick around when the new building goes up on that spot? Maestro – Are you kidding? Ghosts looooove air rights. Up & down. Up & down. Yep, that condo’s going to be haunted but good. Hallmark closed a while back. Eamon’s was not really a restaurant that served the neighborhood, just mostly a bar scene during the week. Personally, I don’t care if another condo building goes up there. Just wish that Rite Aid would get a facelift! Appropo of nothing in this blog but just wanted to vent and maybe get some insight. I’ve lived in Brooklyn Heights most of my long life and have eaten many pizzas in that time. What I wish someone would enlighten me on is: What is it about Grimaldi’s that attracts the long line of people waiting to eat pizza. I’ve had their pizza once or twice (before the lines) and there is nothing about it that would make me wait in a long line. Took a walk down to our beautiful new park on Sunday and there they were–a line of people going half way down the block–waiting to get into Grimaldi’s. Another long line at the Brooklyn Ice Cream Factory, waiting for ordinary ice cream, when there was a Blue Marble cart, with no waiting, selling really delicious, luscious ice cream. Go figure. Does anybody know how tall the building will be at 174 Montague? If it will be high-rise condos it will be at least 11 stories. I believe the Archstone is 34 stories. Archstone is 32 stories… lived there for a year and the view was stellar. The rent was, well, also stellar… maybe will come back down to earth now. And that block is borderline Brooklyn Heights.. it may be in the newly-zoned skyscraper district. The Brooklyn Ice Cream factory has the best vanilla chocolate chunk that I’ve ever had. As far as Grimaldi, mostly tourists. I think the pizza is pretty good but I will not wait in line for it. Rather go somewhere else.